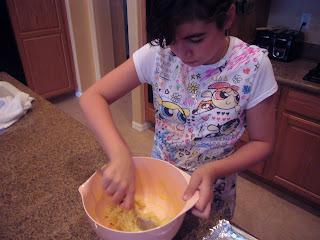 Now that Sabrina is feeling better, she was inspired to take the leftover risotto and make something new. 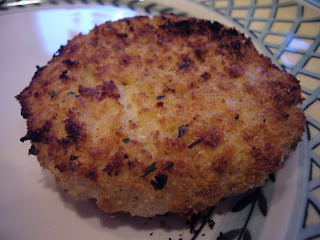 Well, the best thing (besides arancini) is to make risotto cakes. They are fast, easy and delicious. First, put your risotto in a bowl. 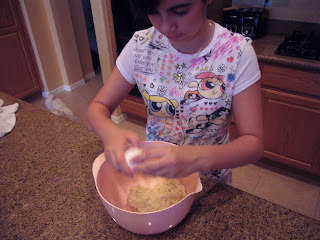 We had about 1 1/2 cups left, so she added 1 egg and some black pepper. Stir it together really well, and if the mixture is too wet, add a tablespoon or so of bread crumbs so that the mixture will hold together. 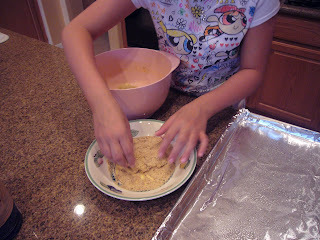 Don't add too much, because then the cakes will be dry. And place on a greased baked sheet. I lined the sheet with foil and sprayed it with nonstick spray. 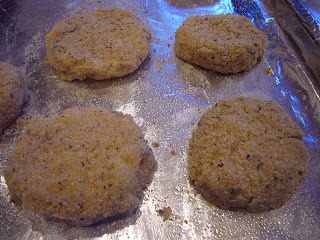 Pop them under the broiler for about 5 minutes per side, or until crispy and golden brown.